So we flipped our Commemorative Stanley Cup Finals Puck for a heads-or-tails decision. Our cherished puck landed on it’s side and rolled to the far corner of our garage underneath the unused workbench. (We had to dig it out from some disgusting cobwebs and a pile of stinkbug carcasses.) 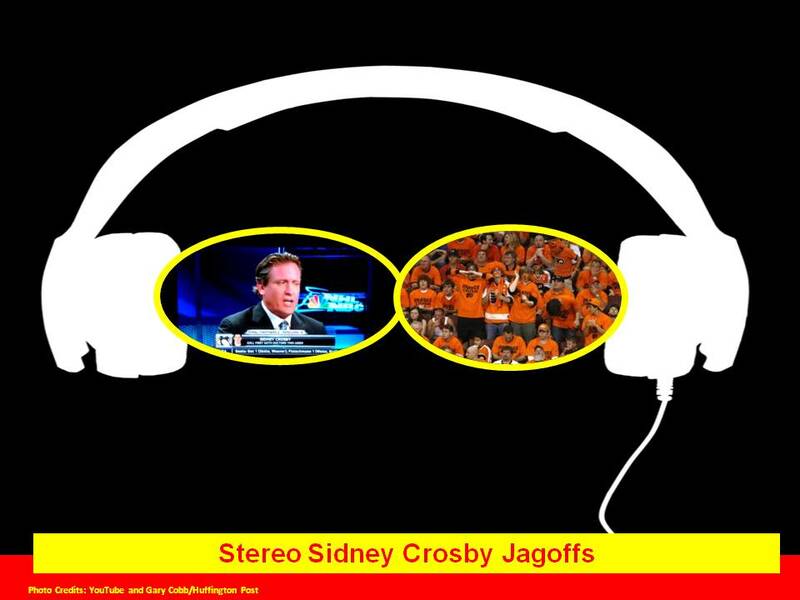 It remained on its edge, soooo here’s a STEREO JAGOFF POST! The first one is easy: Flyers fans, you continue to prove your bottom-feeder status as sports fans AND human beings, Ya Jagoffs!!!! Jeremy, we’re tired of hearing Sid’s NO-NEWS as well. We’ve listened to it all summer while you were off feeding that gambling habit. In the meantime, Sidney Crosby IS the face of the NHL, as Eddie O said in the video. If Sid experiences a post-urination-shiver people want to have his nervous system checked. We’re thinking that we sense some JEALOUSY, on your part, so you decided to make some typical I’m-Jeremy-Roenick-look-what-I-said comments. Right now, somewhere, @Jeremy_Roenick is complaining to his Replica Stanley Cup about all the attention Crosby is getting today. Haaaa.. he’s got it!!! Haaaa. But look on the good side, Roenick-the-Wannabe, with your assinine rant, maybe NOW you’ll get as much media attention as Sidney Crosby. It’s just too bad you couldn’t get this kind of media attention FOR YOUR HOCKEY SKILLS, Ya Jagoff! Special thanks to our Honorary Jagoff Catchers, new Twitter Follower, @Evil_Bylsma for letting us use his quote and to Facebook Follwer Mike Metros for suggesting BOTH should be posted! Previous articleIt’s Raining, It’s Pouring…. SO LET’S PANIC!!!!!!! Next articleHow Do We Know Election Day Is Near? Political Jagoffs Appear!